I got a nice email from a reader yesterday pointing out the attractiveness of the industrial gas stocks as long-term investments and whether I’d looked at them. As it happens there’s a couple of reasons why I haven’t to date. The first is that they don’t tend to hit my stock screens because it’s biased towards capital light companies and sectors (which pretty much throws out a lot of industrial stocks). The second is that they’re not particularly cheap at the moment given where we are in the market cycle. That said this email presents the perfect opportunity to take a look at a pretty interesting niche sector from an investing point of view. When looking at the industrial gas industry three things tend to stand out. The first is that the profits of the entire industry are dominated by a handful of companies, which is always a great sign from an investing point of view. Why? Because for me at least it tends to be the signal for some kind of inherent competitive advantage (or economic moat in Buffett’s language). For example, when you’re dealing with the soft drinks industry the analogous group will be Coca-Cola, PepsiCo and Dr Pepper Snapple Group; all three of which enjoy enormous amounts of brand equity. For tobacco it will inevitably be Philip Morris International, British American Tobacco, Altria and a couple of others. In that case you have brand equity plus a heavily regulated market which now makes it very difficult for a start-up tobacco company to come onto the scene (e.g. they couldn’t advertise new products because it’s so heavily restricted). In the dull world of industrial gases (and associated technologies and equipment) the dominant players are Air Liquide, listed in Paris; German company Linde AG; Air Products & Chemicals; and finally Praxair (the latter two are listed on the New York Stock Exchange). In total I think they are responsible for something like 75%-80% of the profits of the entire industry. In other words if you’re working in manufacturing, healthcare, academia (e.g. Chemistry labs) and a whole bunch of other sectors that require industrial gases and related applications then you’re going to come across these companies and their products. Another point worth adding here that was made in the original correspondence is that there’s little by way of technological disruption. After all it’s kind of hard to replace something like Oxygen, Carbon Dioxide or Ammonia for thousands of applications varying from the mundane to the specialist. Unless we somehow end up back in the Stone Age then the industry isn’t going anywhere. The aggregate result is that they sport attractive profitability metrics that tend to be quite stable. If you imagine an equal weighted portfolio of the four names mentioned above then you’d be looking at combined net-profit margins of somewhere in the 10% region. Similarly, if you were to compare other profitability metrics like returns on equity and capital to the wider industrial sector you’d find the mini-portfolio ranking in the top 20% of stocks. To be able to consistently generate that level of profitability marks them out as attractive long-term assets (at that right price of course). The other thing that stands out with these stocks is the historical returns that they’ve generated to date. 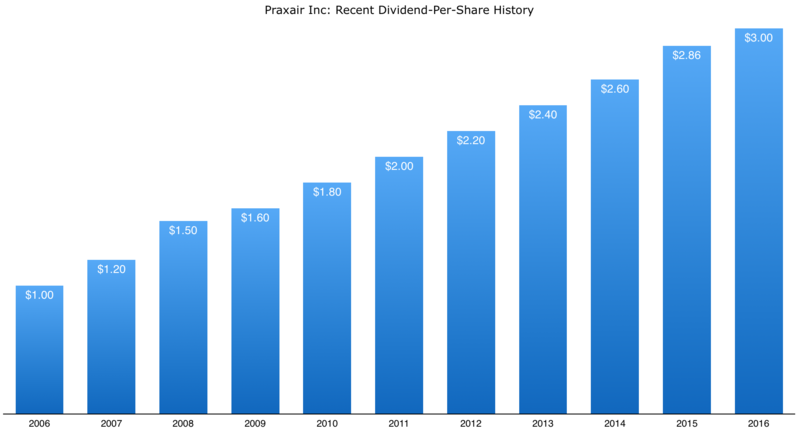 A $10,000 investment in Praxair stock twenty years ago would currently be worth $70,700 including reinvested dividends. That’s equal to annual compounded returns of 10.25%. The same investment in Air Products & Chemicals would currently be worth $70,000 – equivalent to average annual returns of 10.20%. Air Liquide and Linde have delivered similar returns. In a way they are quite similar to the big oil stocks in that both groups are relatively capital intensive yet have delivered good long-term returns with relatively stable dividend histories. In fact that’s probably where most folks are likely come across the stocks in the first place. If you follow the dividend aristocrats – that’s those stocks with at least twenty-five years of consecutive annual dividend growth – then you’ll find Air Products & Chemicals on the list. The last time the company failed to raise its annual pay-out was in the early 1980s. Praxair will make the list at some point next year assuming it carries on as it has done for the previous twenty-four. I don’t have the long-term data for Air Liquide and Linde but the former has managed average annual dividend growth of 8.7% over the past three decades, whilst the latter has seen a respectable average annual distribution increase of 7.75% since the start of the century. One of the only things not to like is the current valuations. With the cyclical industries you’re essentially looking for recessions or a 2009 type crash/bear market to throw up fantastic great long-term entry points. 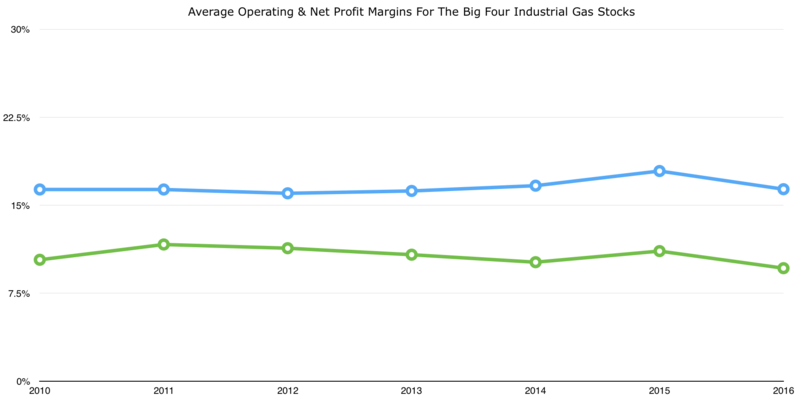 The reason is that earnings and stock prices have a habit of collapsing in these sectors even though the profits for the industrial gas stocks are relatively stable. Praxair for example managed to increase its earnings-per-share in both 2008 and 2009, as did Air Liquide. If you again imagine buying these stocks at the start of 2009 as part of a miniature industrial portfolio you’d be looking at an average forward P/E ratio of 15. That might seem normal at first glance, but remember during recessions the sudden drop in earnings can tend to cause P/E ratios to blow out because the denominator collapses (especially in inherently cyclical sectors of the economy). In other words, the fact that the forward P/E ratio only went to 15x annual earnings shows you how relatively stable the profits are for the industry. Average earnings-per-share for the group of four “only” dropped 13.75% between 2007 and 2009 compared to 65% for an equal-weighted combination of Dow Chemicals, DuPont and German behemoth BASF. In the eye of the worst financial and economic crisis since the Great Depression that’s not too shabby for a set of industrial stocks. As you’d imagine given the subsequent bull market since then the upshot has been a good level of shareholder returns; a significant chunk of which is down to the fact average valuation of the four is now something like 21x forward earnings rather than 15x. Air Products & Chemicals, for example, has delivered compounded annual returns of 16.90% since the beginning of 2009 with a current year dividend yield on cost in the region of 7%. Even Praxair, the worst performer in the quartet over that period, has delivered annual compounded returns of over 10% a year. What does it all mean going forward? Well, at that type of price you’d typically want to be seeing a pathway for double digit earnings growth over the medium-term to be comfortable. Let’s call it 8% once you factor in the average dividend yield of the group, which is somewhere around 2.5%. Given the growth outlook and recent historical rates then at best you might be able to say they’re fairly valued right now. That doesn’t mean they won’t necessarily generate good forward returns from here; just that it’s worth being mindful of the role that the earnings multiple has played during this ongoing bull-market. If you get the chance then take a look back during recessions, because over the long-term they likely represent some of the best industrial blue-chip stocks on the market.